March 30: What’s Up This Week? On Tuesday it’s Trish’s Tuesday Tag: Check it out…it’s an Easter egg tag! Wednesday: BIG announcement or probably it’s April Fool/s Day! Yup! Here is a great April Fool’s. When my oldest was playing spring baseball during his kindergarten year it was my turn to bring the post game snack. It is supposed to be a healthy snack but since I am me and it was April Fool’s Day I decided to bring a snack that looked healthy but was actually not. 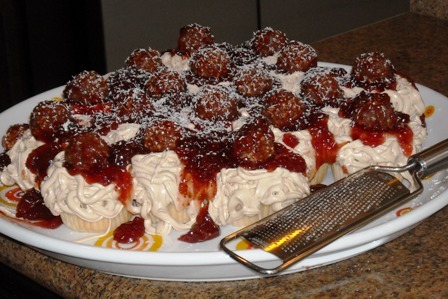 That plate of spaghetti covered in meatballs is really cupcakes smothered in piped frosting, strawberry jam, Ferraror Roche chocolates and white chocolate shavings. The idea (and in this case I darn near followed the instructions verbatim) was from Hello! Cupcake. Great idea! I am glad I was lucky enough to have the perfect excuse to have a little fun! Copy my copy of Hello Cupcake or check out the book for the exact recipe and directions. Now get cracking April Fool’s is only a few days away.